If you are walking and carrying clubs, you can slip it over the golf bag using any solid sun visor mount and expandable cradle. Be sure it’s a high quality cradle and keep your eye on the phone to make sure it doesn’t slip off. If using a manual push cart, there are a lot of solutions to place it over the round tube near the handle. Use any strap mount that is made for a bicycle to keep your device at a convenient location. And here’s a little secret for those owning a Sun Mountain cart: the umbrella hole that is part of the cart is the same screw pattern as a camera tripod so buy a mount that uses a tripod screw. Hopefully you are fortunate enough to driving an electric cart. I love these things. Have been to a few private courses where they start you out by outfitting your cart with snacks and beverages. As if that’s not enough, they have a beer cart that drives around the golf course to load you up with more snacks in case you ran out of the first batch they gave you. I write a blog about mounts, I’m not a very sophisticated guy. It takes very little to impress me. Anyway, these carts have more cup holders than my SUV, and like I said, there’s a beer girl to replenish the frosty beverages so you don’t need to use all the cup holders. Use one of them to hold your GPS. Do that using the Bracketron Cup-it Mount. These work in a golf cart as well as a car. If there aren’t any free cup holders, consider a suction cup mount that can attach to anything smooth and flat. The same one that would be used in a car for a windshield works on a golf cart. Most electronic carts are made of fiberglass so finding a smooth flat surface to place your device should be easy. I like the Bracketron Grip-it Suction Mount. Of course, there is also the windshield but I recommend avoiding the windshield on a golf cart as they do not seem to be as sturdy as one found in a car. 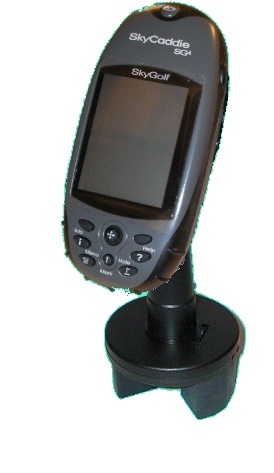 These work on most golf GPS devices as well as many smartphones.